Well, souvenirs actually. I liked the sound of the title better as "A Souvenir of Nantucket," since it sounded more old-fashioned to me. And that's what I like about Nantucket: it is old-fashioned, in the best sense of the word. The pace is slower, the air is cleaner, and there is little here to jar the eye, that seems out of place. Nantucket still retains a lot of what I fell in love with when I spent my first summer here as a little boy, more than forty-five years ago. Some people complain that Nantucket has become "Disney-fied" over the years, what with its rigorous zoning and enforcement of aesthetic codes designed to preserve and promote the island's heritage as an eighteenth- and nineteenth-century whaling center, and then as a vacation destination for the nation's WASPy Eastern elite. Well, if that means there are no big-box retailers on the island, no invasive light pollution, and no Tuscan-style condo developments littering the landscape, then that's just fine with me. Yes, there are a lot of ridiculously expensive stores in town catering to the island's richer-than-rich population, it is hard to find a decent house to buy for less than several million dollars, and the restaurants are as pricey as ones found on the UES of Manhattan. But you don't find the attitude or aggressiveness or the midnight traffic jams here that you do in the Hamptons (a place I'd as soon visit again as have my fingernails extracted), and so long as you steer clear of the insanely picturesque town of Nantucket on weekends (which becomes unbearably clogged with day-trippers), then it is a remarkably serene place to spend a leisurely and relaxing vacation. Oh, and most of the people you see out and about are actually wearing real clothes. The other day I saw a gaggle of college-age boys in town horsing around with each other, and not one of them was wearing a tee shirt, cargo shorts, or flip flops. They were all casually dressed, to be sure, but they were wearing shirts that had collars, bermuda shorts, and loafers or boat shoes. They looked great. What a pleasure it is to come to a place where people still have standards. This year, for the second summer in a row, we've rented a sweet little salt-box shingled cottage sitting on a bluff overlooking the ocean in a sparsely settled area of the island. Plain and simple. Nothing fancy about it, but rather "just so," and as satisfying as tucking into a perfectly cooked lobster pot pie washed down with a cold bottle of beer. There is no internet service at the house (I'm writing this sitting at a table at the Nantucket Atheneum), and I have to get into the car and drive around in order to receive a signal on my BlackBerry. The lack of electronic connections at the house is rather inconvenient, I admit, but it does enforce one's resolve to "get away from it all." 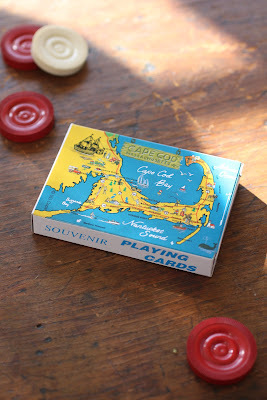 The weekend that we arrived on the island we attended the Nantucket Historical Association Antiques Show, where we came away with a number of souvenirs of our visit. While Reggie has been known to buy a refrigerator magnet or two while on holiday (including one on this vacation) he generally aspires to acquiring loftier trinkets than the basest run-of-the-mill sort to commemorate his journeys. The antiques show we attended was a happy hunting ground for such purposes. 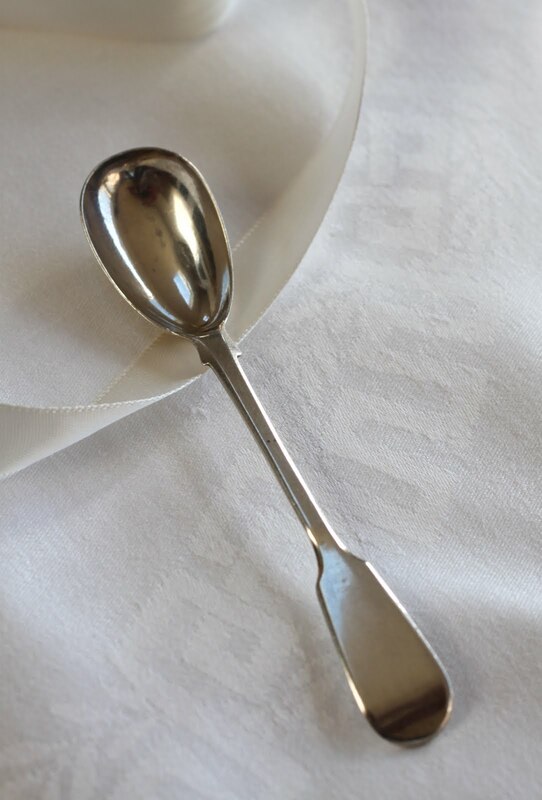 The first thing we found to buy was at Kathleen and Roger Haller's Silver Plus Antiques, where we purchased a diminutive silver mustard spoon (it's only four and seven eighths inches long), made in England in 1831. We already owned a number of what we thought were mustard spoons, that look like tiny soup ladles. However, we learned from the Hallers that what we own are, in fact, condiment spoons, and that mustard spoons have oblong bowls, as is shown here. With that new information in hand we had to acquire a spoon appropriate for the delivery of England's favorite accompaniment to roast beef. Our other purchase at the show, after much dithering on my part, I admit, was a pair of charming watercolors of coastal Massachusetts. We found them at the booth of Carlson & Stevenson, who thought they possibly depicted the ruins of the old Sandwich glass works on Cape Cod. 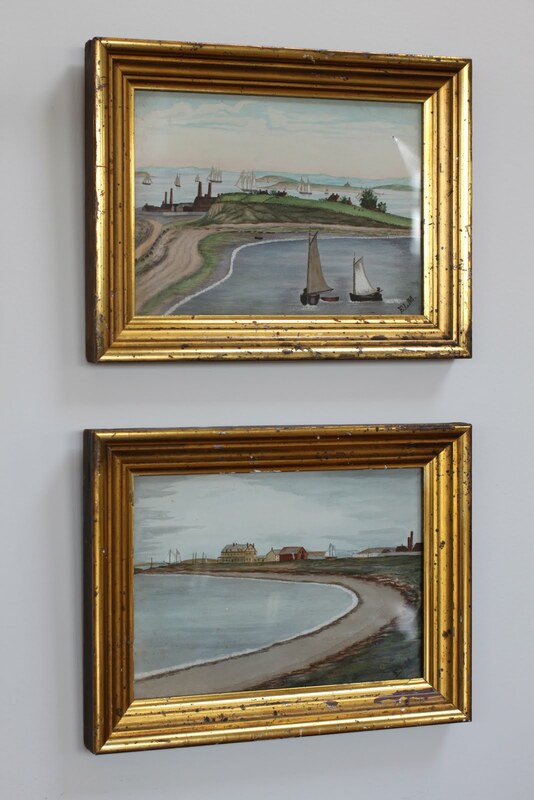 They were painted by an E. L. Moore of Southbridge, Massachusetts, in the 1880s, and have a marvelous limpid quality to the sky and water depicted. I was immediately drawn to them. The pictures are small, measuring only 9 ½ inches high by 12 ½ inches wide, including their frames. I bought them to hang in our flower arranging room at Darlington House, where I look forward to seeing them and pleasantly remembering where I found them. One of the antiques shops that we always make sure to stop in when visiting Nantucket is Linda Willauer's charming shop in town specializing in eighteenth- and nineteenth-century English and Chinese export ceramics. It is a veritable emporium of antique figures, dishes, serving pieces, tureens, and jugs stacked chock-a-block floor to ceiling, accompanied by every imaginable decorative period accessory to go with them. As readers of this blog well know, we have a weakness for such things! 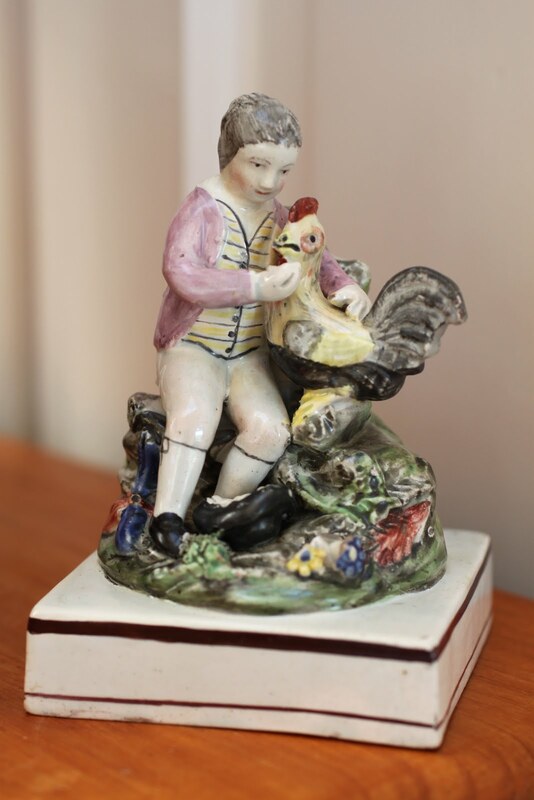 Over the years Boy has bought a number of figures from Ms. Willauer, and came away from her shop this visit with a sweet early Staffordshire pearlware figure of a boy feeding a rooster. Boy has been eyeing this particular figure for a number of years—both in Ms. Willauer's shop on Nantucket and in New York where she exhibits at the shows—and finally succumbed to its charms once and for all. 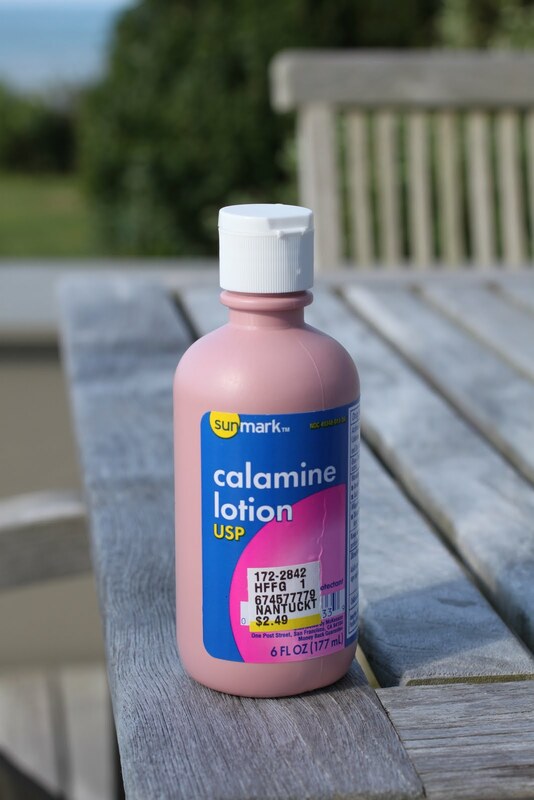 In closing, I leave you with an image of another old-fashioned souvenir of Nantucket: calamine lotion. As I wrote earlier, the house we have rented is located in a sparsely settled area of the island. It is far away from the manicured lawns and perfectly maintained privet hedges of the town of Nantucket or the village of 'Sconset. The landscape where we are staying is mostly untended, and mostly wild. And lurking in much of the bushy scrub is that most pernicious of plants: poison ivy. I've come down with a minor case of that vine's infernally itchy rash, despite valiant efforts on my part to steer clear of its evil, oily leaves. That is because our dear little Pompey is a most efficient delivery device for spreading the plant's venom to unsuspecting fellows such as I, particularly when he snuggles up next to me in bed at night, which he is wont to do. Much as I do love to let the little darling run off lead when it is safely possible to do so, he has been firmly leashed to my side when crossing the threshold of our house ever since I realized that he was the source of the inflammation that precipitated the purchase of said calamine lotion earlier this week. It is, for me, a somewhat unexpected souvenir of the island, but fortunately it is a far more impermanent one than those we happily found elsewhere during our visit. How very idyllic all of this sounds to be and we are certain that it is exactly the kind of place we too would choose for a seaside holiday. Indeed, anywhere on the coast which remains unspoilt and far from the madding crowd is a recommendation in itself. 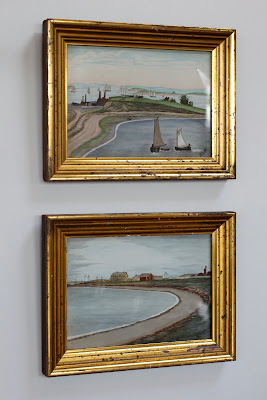 Your purchases to date are in themselves a delight and we especially like the two small watercolours, not dissimilar to some we own which date from the same period and executed whilst the artist was on the Grand Tour. As for the mustard spoon, it is reassuring to know that standards are indeed being correctly maintained at Darlington House, although we have never doubted that. We do so hope that you both will continue to enjoy the holiday and that Pompey will not be the future cause of any need for Calamine Lotion [something we have not thought about in years!]. Reggie what a wonderful post. 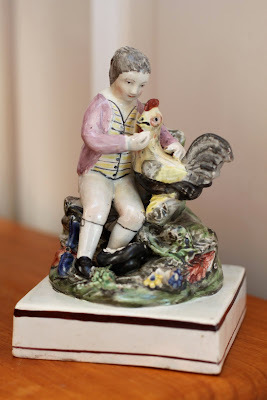 The figure of boy and rooster has such a tenderness about it. Calamine lotion! I was wondering just the other day if one could still buy that stuff. I used to wear it all summer, courtesy of the mosquitoes that flourished in the Midwest summers. My children have been bitten this summer, and I was explaining how my mother used to apply the pink stuff to my bites. I will have to look at the pharmacy for a bottle to keep on hand. Your vacation sounds lovely, Reggie. Reggie, I sometimes think I only have to come near Poison Ivy to break out. For future reference, Calamine lotion now also comes in a clear version. I used to spend childhood summers drenched in calamine lotion and had completely forgotten the stuff. A good, relaxed read, Reggie, and an incentive to try Nantucket for a vacation. Those two little watercolors are the perfect souvenirs. Closely observed, naively painted yet still accomplished in execution, a beautiful balance of colors, totally charming. Sorry about the poison ivy! And as always, a lesson in identifying the mysterious array of mystifying 19th c. flatware styles to thank you for. Glad you enjoyed your vacation. I always make it a point to buy something I adore from a place I adore visiting. It is the next best thing, aside from a photograph, to rekindle fond memories of travels. Enjoy your souvenirs and welcome back from your well earned hiatus. You have been missed. I loved reading your charming ode to the Grey Lady as I am a devoted Nantucketer as well!! I love many of the same things you do - I remember when there was (briefly) a Benetton on Main St. - never again Islanders said!! I guess Ralph Lauren and Lilly are viewed as island appropriate and not big box. Sorry to hear about your poison ivy but it's better than the other Nantucket blight - ticks!! I looked at that box of cards and thought for sure you'd gotten saltwater taffy! Especially love biking everywhere I go. And those 'Sconset cottages steal my heart every time. Tiny. But adorable, especially when the roses are blooming. Sorry about the poison ivy! You are at one of my favourite places in the USA. It is a magical place and the light is spectacular. The mustard spoon is beautifully designed. I love your idea of expensive antiques as travel souvenirs. A hand-wrought silver mustard spoon will induce great memories of your trip. Also, thanks for the intro to the Nantucket Atheneum. I followed your link to its interesting history, and it is still being put to good use. 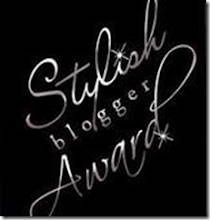 You have what must be the most elegant blog in the Blogoshere. I remain a loyal reader!! My favorite comment is about the college guys with collars and shorts. I am glad it's not just me...at 53, I won't let my two boys (13 and 9) out without collared shirts (though as we live in Baltimore, a polo and a pair of lacrosse shorts will do at their ages). My wife and I prefer to vacation as do you two, and it becomes more difficult to do so every year. Here's to those of us who's standards remain high! I would have to say that the souvenirs are all rather lucky fellows. Now all of them expect that devilish PI. I cannot even begin to say the 2 words. My dermatologist told me that dogs do not carry what humans do to pick it up. God spared the lucky creatures. Enjoy re-entry back into the less than civilized life. And I just wrapped up two weeks working in Southampton, your comment makes me laugh. I still enjoy being out there, even with all its garish excess and attitude. How though have I never been to Nantucket proper? Beyond me. Oh, and just this week I used calamine lotion for the first time in years--the mosquitos of New Jersey are murderous. The deck of your rental home looks quite perfect. I would love to return to Nantucket, we were there over a decade ago. We did the tourist thing and visited the whaling museum, which was delightful. A lovely island and such good shopping, hard to improve on a holiday such as this! Next time you are plagued by the demon Toxicodendron radicans, try Technu. It's a product created for the workers at Los Alamos Laboratories who were occaisionally contaminated with radioactive waste. This cleansing lotion was designed to remove the oil soluable waste and it proved quite affective at absorbing the urushiol, which is the toxic oil that causes the itching. You can even use it days after the exposure. Once you've had a reaction to an exposure, you'll likely react if exposed again. So if you plan to do any hiking or gardening in the future, you can also try an product like Ivy Block, which will help limit your exposure. Good luck. Sounds like a relaxing vacation. Darling Reggie, you are missed. Hope all is well in your world. and I'm in looooove with Nantucket too!!! Liquid starch is a good poison ivy remedy. I know you have that on hand for ironing the linens! am unable to travel at an arthritic 83 years but I am so happy to have mementos of days of travel and fun and finding special items which I now enjoy daily. My advice to you and Boy is to love life travel, shop and have a load of fun.